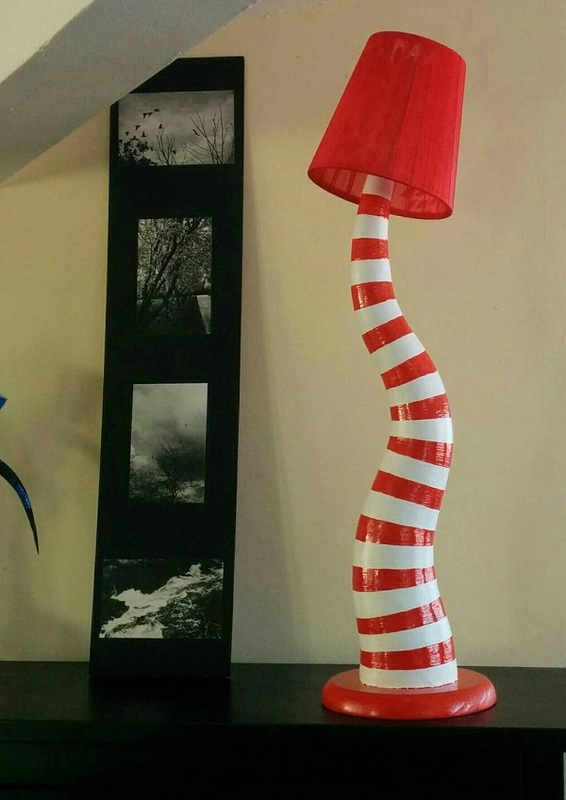 On sale, now: A desk lamp fashioned after the style of maybe, something you’d see in “Beetlejuice” like the twisting, winding body of a snake– perchance, diving through your table like an optical illusions of wriggling stripes. 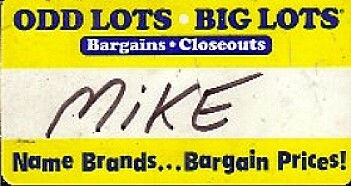 Odd Lots, “Big Lots”– like something you’d find at this close-out store of bargain-basement derangement “on clearance”. Oh, yes– they sell all sorts of junk that regular stores otherwise “couldn’t get rid, of” though something tells me that the lamp will be sold for premium prices online. But the ethos of “Big Lots” is an example of sketchy local character in my very own backyard, one of the run-down suburban areas that circle the city, proper. A local author once published a book called “White Palace”, a take-off on the restaurant, “White Castle” around these parts with their famed “belly-bomber” hamburgers sold, “10-to-a-sack” an an allegory unto grungy dreams and work-a-day worlds. You’d know this place, if you saw it. Down by a stretch of rail-yard overpasses and sidewalks kicked-up with feld-spar and soot as the large billboards advertise “worker’s comp” lawyers seen on television as the roar of motorcycle engines thunder past. Practically every woman works as a waitress with a particular out-state, countrified drawl as the grassy, run-down yards are uncut and as tangled as the mullet-style haircuts on the men. As it was diapers, toddlers, and a room fool of bandanna-ed confederates commiserating over cigarettes. . . . . and how the beer was always ice-cold. You’d find a touch of “Beetlejuice” around these parts. Location equals character as the night-shift is his home and you’ll always see a zoo of local flavor on Saturday nights down at the local Shop n’ Save as everybody and their stump-toothed cousin goes out to buy beer, ambling-out the door with bare, toothpick-like arms, a greasy cap, and clinking bottles as the night time is “the right-time”. In real life, say– he’d doubtlessly work as a manager at the “Big Lots” store I was talking about– haunting the back warehouse, down there with the mechanical box-crusher and forklifts full of close-out junk as he grins and slithers salaciously across the cold, cement floor– harassing the female employees and otherwise walking-around with his keys jingling in his belt-loop in a red apron. He’ll have plenty of sleazy, low-down adventures that brings comedy to the local area and great exposure for the part of America we rarely think of, but makes-up the industrial back-bone of all our days. Before you think you have him pinned-down he’s off somewhere else wreaking mischief as the drop of the word. At a blog near you. Tell your friends, re-post constantly– we’re #1! !